Businesses owned and operated by spouses can become complicated as professional and personal lines become blurred and tensions and stress intrude. 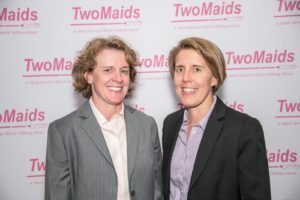 Mari Millard and Marnie Hammel, co-owners of Two Maids and A Mop, will discuss the decision to go into business together and the tips to stay in business together. Conflicts and resolutions include: financial stress, management style, division of labor, compromise and shared vision. Learn what makes their couple-preneurship work and what to avoid if you want to have a successful co-owned business and a long term harmonious marriage. Marnie Hammel is an attorney and a licensed HR specialist with over 20 years of experience. Prior to purchasing Two Maids and A Mop, she spent the majority of her legal career working within the insurance industry and was a frequent present at both small and large venues. Throughout her career she was an associate with a large litigation firm, an Assistant Vice President and Senior Supervisor with an international insurance company and a Vice President with an international insurance broker. Marnie is the mother of twins and an Ironman triathlete.